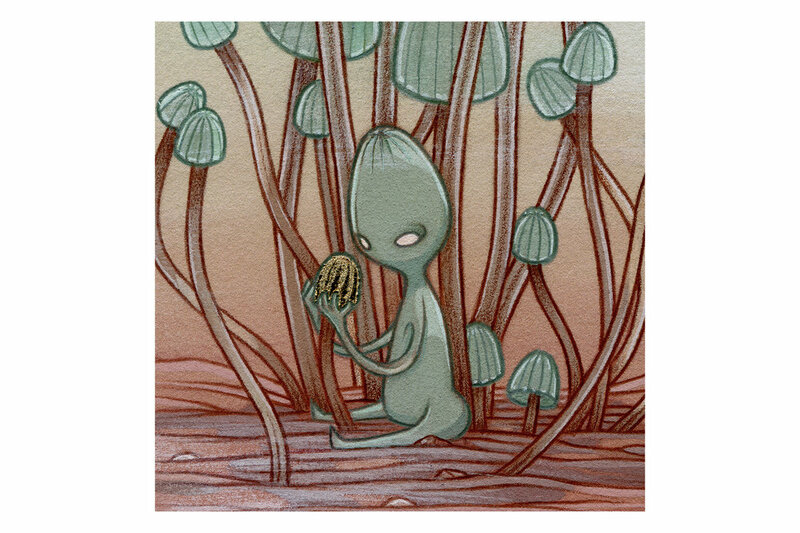 The Kinoko Kami (or Mushroom Spirit) tend to come in many shapes and sizes- their appearance determined by the kind of mushroom that they represent. This particular specimen shares the near-cone-like head shape and pale green body of it’s mushroom cluster. Kami are not beholden to the particular creature, plant or object that they come from. They are wholly independent in mind and body. Many choose to roam fairly far from their physical “representative,” engaging in their own rituals without a single thought given to the physical plane. However, due to the nature of their existence it often behooves them to actually watch over that which created them. You see, when something is first “born” (or in the case of inanimate objects “created”) the Kami representing them is formed as well. So when the mushroom cluster (shown in the painting above) first sprouted, this particular Kami also appeared in the Spirit Realm. Unlike these mushrooms, however, Kinoko Kami neither age or grow. They also have no need for food or water. They come into existence fully formed with a consciousness fairly well developed (though entirely lacking in experience). Little is known about just how much knowledge they have to begin with, but their movements suggest a wisdom possibly derived from a communal source. Here is the catch: when that mushroom cluster withers and dies the Kinoko Kami representing it ceases to exist in the spirit plane. Their existence is intrinsically linked to the thing they represent. This means that certain spirits’ lives are more finite while others can last centuries. And this knowledge is not lost on most Kami. This is why many choose to act as “guardian spirits” to their representative in the physical plane. They follow them around, or simply tend to them. While it is also unknown just how much spirits can affect the physical world there are many theories that revolve around the idea that these creatures can actually help if/when it is needed. The Kinoko Kami represented in this painting is a Kami that has chosen that role. The mushroom cap it is examining (represented with gold leaf in the original painting) is unlike the others that grow around it. The spirit seems to be trying to determine if this discoloration is harmless or should be addressed. The longer this cluster exists and thrives, the more this Kami can experience existence. It is a link that is both lovely and terrifying- and why this particular Kami sees the need to make sure these mushrooms continue to stay healthy.